Four hundred years ago in Japan, a Zen priest picked up his calligraphy brush and painted a scroll extolling the Ten Virtues of Incense. Although we do not know who this monk was, we know from his writing that he had a great appreciation for fragrance. As the popularity of aromatherapy, essential oils and incense increases, it is wise to consider his observations. Fragrant offerings to divinity have always been a major part of every devotional ceremony and ritual. A tear of frankincense melting in a censer; a stick of sandalwood on the altar; a sprinkling of white sage on rocks in a sweat lodge; a bowl of smoldering palo santo chips in an Andean curing ritual; these are the universal expressions of humanity’s desire to communicate with spiritual realms. But how does fragrance allow us to communicate with the transcendent? Does it form a bridge between the material and immaterial worlds, symbolized so perfectly by smoke rising into the air? Does it attract beneficent devic beings who love the fragrance, taste and appearance of the offerings, nature’s most beautiful creations? Does it affect our brain chemistry, creating higher states of mental clarity and sattvic emotions, thereby bringing us closer to the ineffable? Does it give substance to the prayers we utter, or external shape to our inner thoughts? These are all ways that people through the ages have explained the powers of using fragrance for communicating with the transcendent. Aromatic plants and essential oils are some of the world’s most potent antimicrobial substances. The purification of atmospheric toxicity and cleansing of air-borne pathogens is one of the greatest benefits of these fragrances, especially essential oils used in diffusers. Botanical fragrances also lift the spirit from depression and calm the agitated mind, removing the impurities of stress and unhappiness from our consciousness.Unfortunately, most incense and many aromatherapy products such as scented candles are now contaminated with synthetic aroma chemicals, which can cause headaches, allergies and even cancers. In the time of our Zen priest, pure botanical perfumes and incense were good for the body, mind and immunity; now they are a source of impurities and potentially toxic. Some botanical fragrances can act as gentle stimulants to the limbic system of the brain, increasing alertness and concentration, enhancing the capacity for learning, improving memory and assisting many other cognitive functions. A wide range of essential oils offer these benefits, such as rosemary and mellisa. Solitude is the abode of those who seek communion with the transcendent and those who seek refuge in the quietude of inner contemplation away from the distraction of noisy crowds. Alone in a cave, alone in a monastery cell, alone in the forest, alone in the desert, the mystic enjoys the companionship of wafting incense. Sprinkling a few pinches of aromatic powder on the coals as we meditate late into the night, we become like our Zen priest, one who practices “listening to the incense”. 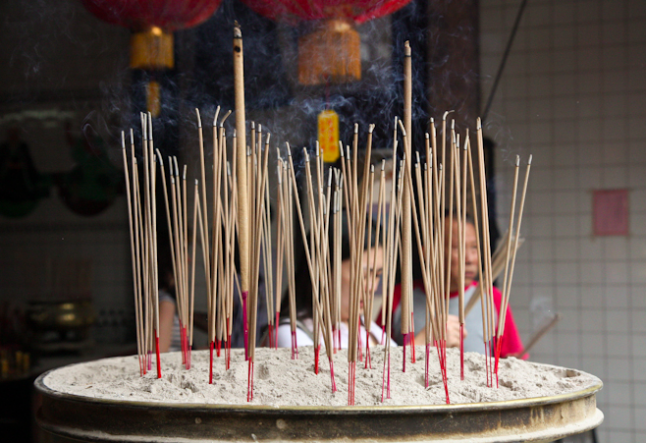 For those who cannot abandon their worldly responsibilities, the simple ritual of lighting a stick of incense, placing a tear of resin on a coal or filling a diffuser with a fine essential oil is a way of stepping outside the confines of routines and habitual thoughts. We tire of our daily routines, but we never grow weary of nature’s aromatic blessings. Instead, we long for aromas that were once plentiful: the fragrance of orange blossoms that filled the air of Southern California, the alpine freshness of disappearing conifer forests or the jasmine blooming in the courtyards of our childhood memories. Only a pinch of agarwood powder will fill an entire meditation hall, instantly deepening the concentration and contentment of all present. Only one tear of frankincense is needed to transform a chaotic home into a temple. Age affects everything; this is the law of impermanence that our anonymous monk should know well. Some ingredients of incense and some essential oils such as citruses degrade within a year, especially if not stored properly. Others, such as oil of rose and frankincense, have a life span of many years. Yet our monk is not entirely incorrect in his observation. Aromatic oils and unguents discovered in ancient Egyptian tombs still contained their fragrance thousands of years later. Resins, such as those used in the embalming of their mummies, do not decay, and their aroma continues through the millennia. When made properly, as in the Japanese tradition, it is possible to capture and purify the aromatic ingredients in ways that make incense very long-lived. And some fragrances, such as essential oils of sandalwood, vetiver, patchouli and agarwood, get better with age, becoming priceless treasures after a hundred years. In the days of our unknown monk, the ingredients of incense and perfumes were derived from plants and therefore relatively harmless. Now, we must amend his words, and consider the pervasive contamination that afflicts the world of fragrance. Toxic ingredients now make many kinds of incense, essential oils, perfumes and aromatherapy products hazardous to health. Yet the words of the monk are still true, if we modify his statement slightly: “Used every day, pure koh does no harm”.